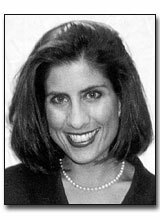 Lisa Rosenfield served in various capacities with the Los Angeles Marathon from 1992-1996, eventually becoming its Executive Director. She was responsible for the organizing committee’s daily operation, including marketing, promotions, media and community relations, personnel and athlete recruiting; as well as training and supervising the management of 15,000 volunteers. In 1996, the L.A. Marathon, with 36,000 total participants, was the largest single-day sporting event in the Western United States.